Great page, but I think you need a format rework: on many computers the side pane makes the blog content drop to the bottom. At first I just thought your page was all adds and links. Wow, you sure get a lot of comment spam. I just wanted to say that I like the first tip: "a.) Kicking without keyboard is a must..."
I will go and learn see if this kicking thing really helps. Thanks for the tips! I will give it a try. I am teaching my kids (8 & 6) how to swim and this is very helpful. Do you have any special advice for teaching kids. this is a great site. i'm 23 years old, male and i can't swim. i've attempted to learn, but gave up in the past because i couldn't float. i believe though. i have to learn and i have to learn NOW. if i go everday and practice, how long do you think it'll take me to learn how to swim? my lowerbody is like a sack of rocks. any drills, exercises, tips or suggestions? im going to stay tuned in on this site because im actually going to enrol into an adult swim class at my nearby ymca. what a great blog. thank you for your insight. Nice advice! Do you have any advice about how to swim faster for longer? Does it have any thing to do with your stroke? @Air Jordan - you can subscribe here http://feeds.feedburner.com/TheSwimmingHub or if you browse the left column of the blog you can find more ways to subscribe, even via email. @Air Jordan Shoes - please see the left column for RSS feed instructions. @herana - the template is not free and cannot be downloaded as I created it. Improving your freestyle kick drills will definitely have an effect on your fitness levels! 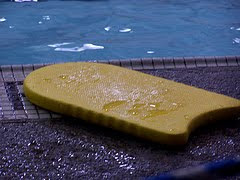 So many beginner swimmers avoid working on their kick. Which is too bad. Drills like single leg kick, vertical kicking and others are simple and powerful ways to not only improve your kick but to swim faster!